Hello everyone! This time I want to talk about the anatomy rules I follow to create my anthro Dog or furry characters, also applicable in bears. I call these species the Custus in my webcomics (Custus comes from the latin "Custi", it means guardian) The following are just a bunch of commentaries about the design of dog characters in the style of Rob or Tara, also applicable to create similar to Martinez. I'm not sure if this will be useful as a tutorial, but I'm sure somebody can learn something by reading the notes and analize the sketches I'm going to put along this blog entry. The Xeno dogs are usually very similar to Rob, this means they're big and robust, but this same structure is possible to adapt and make thinner characters like Martinez. A comparative between a male and female dog, the contrast of the female figure is achieved by making her thinner and with more curved lines. The male structure is more square. it's important to notice the neck of these characters is usually wide and the head might be located a bit forward. 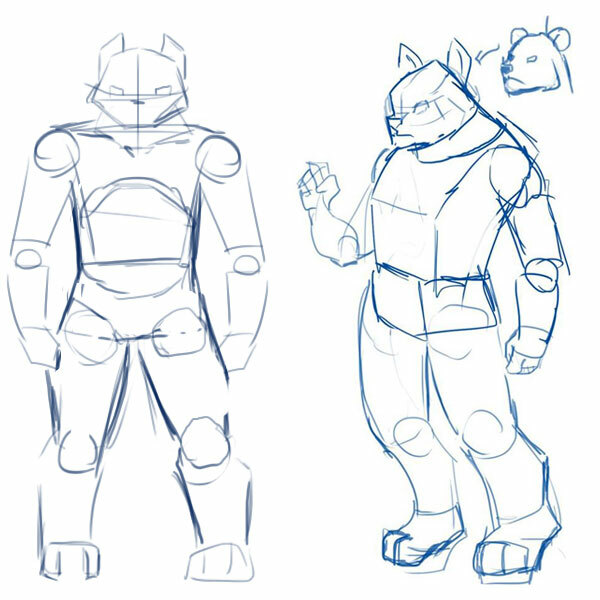 A front and side view, a little note about it: this same structure can be used to draw bear characters, you just have to change the ear shape, you'll get a pretty decent bear even if you don't modify much else. The female body structure is less angular and posses more thinner or normal necks. Despite this, they tend to preserve a more robust build than the rest of the species. I like to make very noticeable the difference between males and females in my creatures. The Xenos have sexual dimorphism. 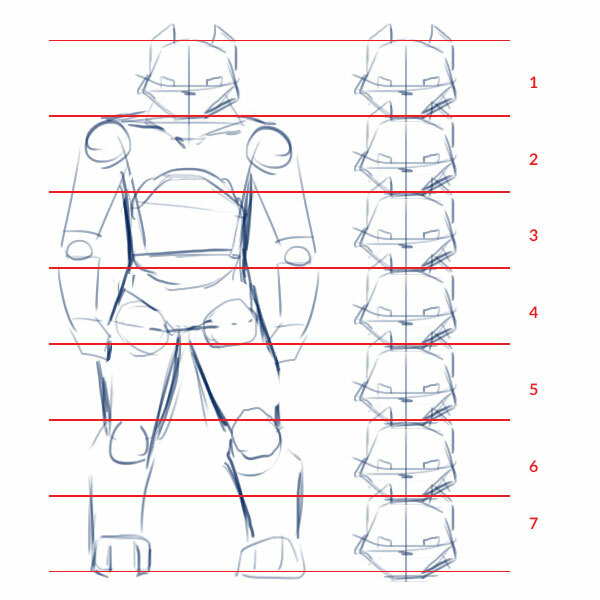 I usually construct my characters with a body proportion of 6-7 heads tall (this is an approximate measure), but it can vary from race to race, but my cat characters, dogs and sheep usually follow this rule. 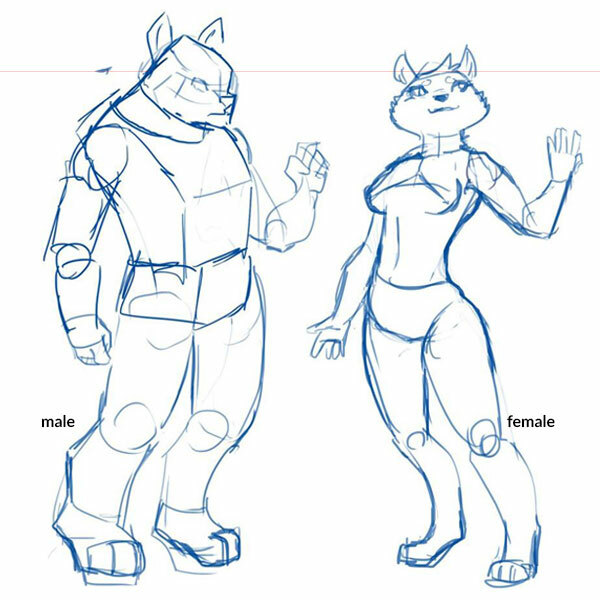 My characters aren't much taller and don't posses a full human structure, this is because I like that people can tell the difference: they are humanoid creatures. A comparative between a robust Custus like Rob (A) and a thinner one like Martinez (B). 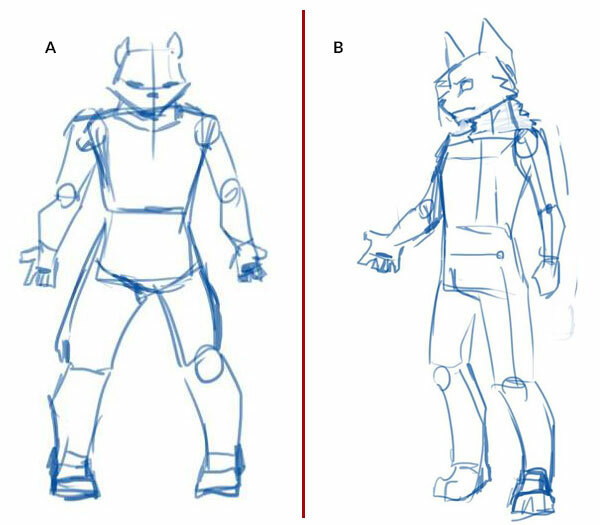 you can normally achieve B by making the legs, arms and torso more thinner and longer in some cases. The neck structure is mostly preserved. 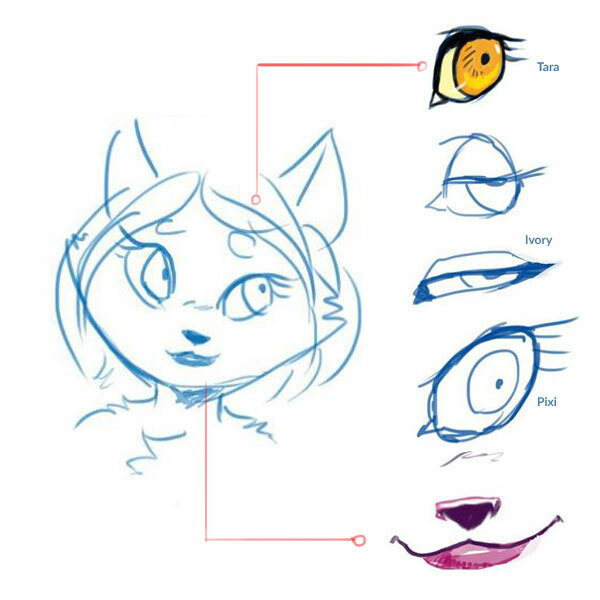 I will try to make some notes about my feline characters, which structure might be more easy to use to create less robust dog characters too. I won't cover the arms in these notes, since it isn't such a very important element in this species. 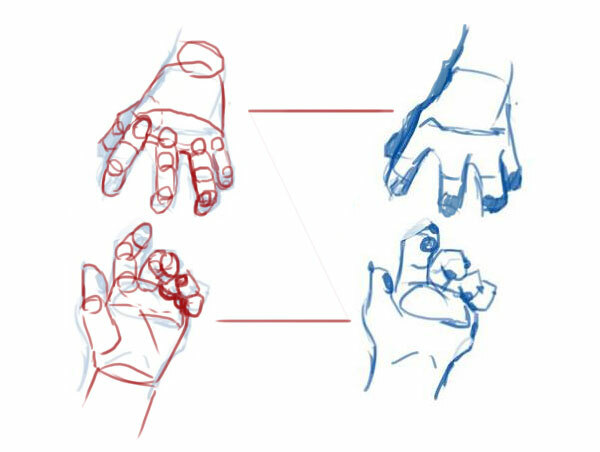 Some notes about hands, the Custus hands are less developed than the rest of Xenos, but they're equally build using cylinders and circular articulations, the final look are somewhat fat fingers and a bit geometric. The female hands can be more delicate and smaller. 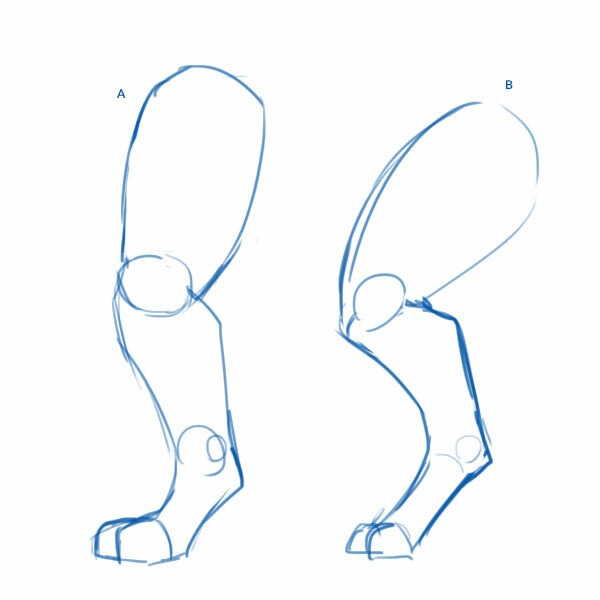 A sample of how to trace the general structure of the legs and foot of dogs like Rob, you can make the leg taller and thinner to create less robust characters. 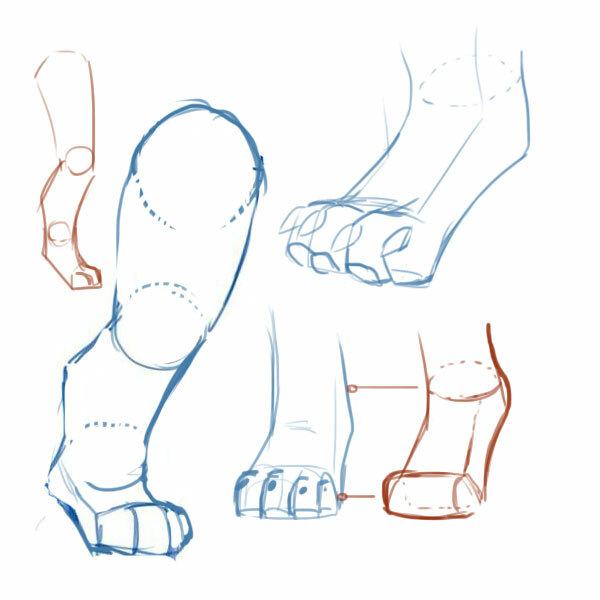 It's important to take into consideration that the feet fingers are very stylized and simple in my comic style. This is a detail, in my comics Xenos have different development stages, when they're younger they have more animal details, this is more notorious in their hands and legs, specially in the legs as you can notice they have more blended legs when they're young. A quick example: Tara from Project Prime - THE VOID. 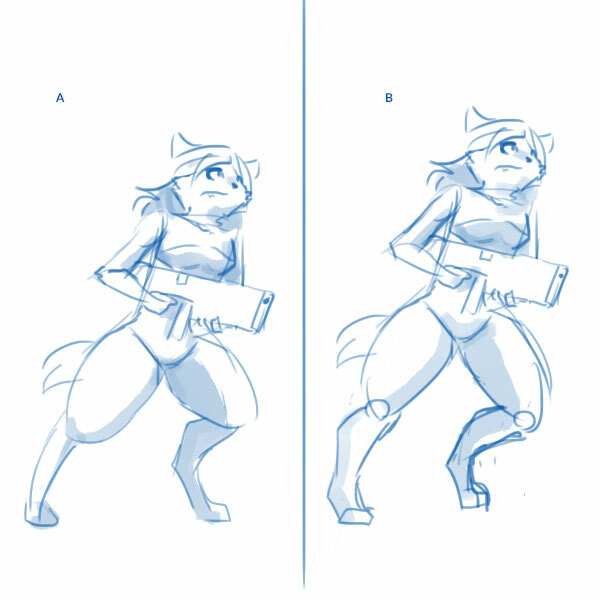 if you look at The Void webcomic pages you will notice Tara and Titch have type B legs, this is a subtle detail because they're younger than the rest of the characters seen there. 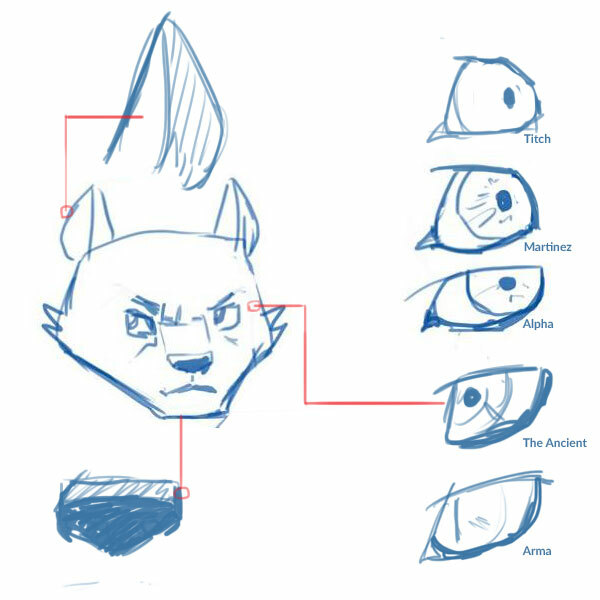 I'll comment here just some basic details of the Custus face design. In the example A, you can see the line differences between the male and female head. In the example B you can see the basic difference in their profile view. C shows both faces in a general way to tell their differences better. Females have more rounded heads and features. Females have exaggerated eyelashes . The female forehead is rounded, never flat or angular. The female chin is less developed. 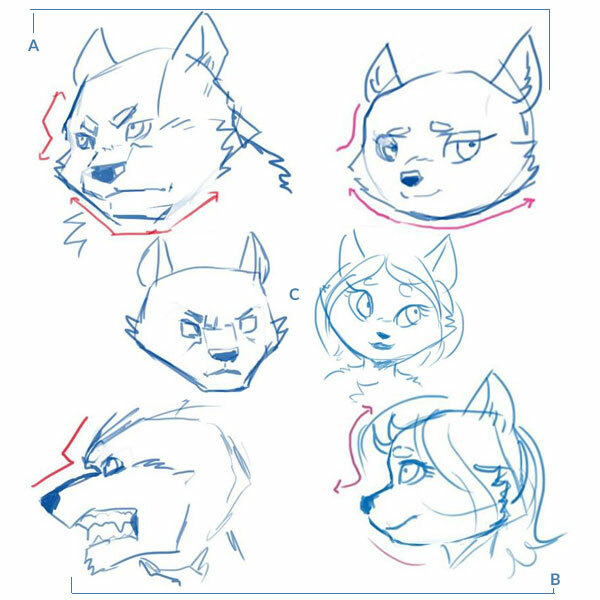 Here you can see the male head from the previous image (C), from this is important to highlight the following that you can add differences and customize your character by modifying: the shape of the eyes, ears, also the size and position of the nose. You can also make the muzzle more or less wide, or longer. This shows the female face from the first image (C), the female head is clearly more rounded, with a smaller nose, bigger eyes and a less developed chin. You can also customize the head by adding a colored lip in the muzzle (just the bottom), but this is only optional and you can skip it. The Custus are a canine species, generally bigger than the rest of Xeno species seen in the comic, but they still share common design traits: The key differences between the female and male face/body structure are followed by all of the character species.